A historic nosedive in state tax collections extended into the third quarter of the year, and only an infusion of federal economic stimulus money has averted widespread program cuts and worker layoffs. Tax collections from July through September dropped an average of 8.3% from a year earlier in the eight states that release up-to-date monthly tax figures, a USA TODAY survey found. New York's tax collections fell 8.9%, despite an income tax hike earlier this year. States reporting partial third-quarter results showed a similar downward spiral in tax collections, including 13.2% drop in Arizona. Federal stimulus money has protected states from making big cuts in the number of government workers, in aid to schools or in spending on Medicaid, the health care program for the poor. But most federal stimulus money ends in December 2010. 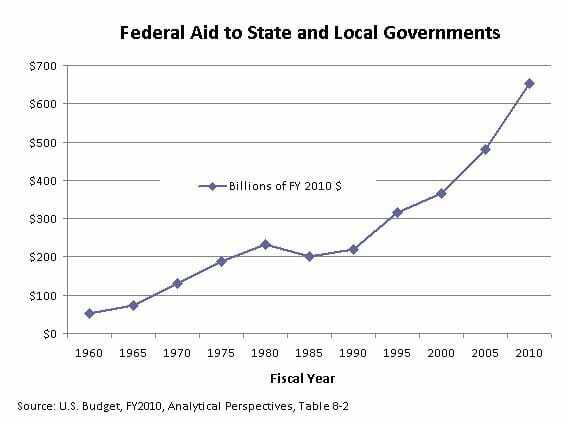 According to the Goldwater Institute, over a third of the AZ state budget is federal money. How can there possibly be any accountability for how this is spent, though it actually is larger than the amount raised by state taxes? If we want the government to buy us goodies in this state, we should at least pay for them ourselves and not take money from others. 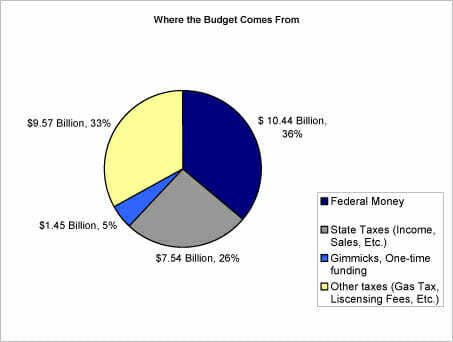 By the way, every time I raise this argument, someone says "well our state pays more federal taxes than it gets back." First, every state says this so it can't possibly be true in every case. Second, it's a terrible practice from the standpoint of accountability. The biggest single national political donor in the country during the 2007-08 election cycle, according to OpenSecrets.org, was the overwhelmingly Democrat-supporting teachers union the National Education Association. What category of worker was the biggest single beneficiary of stimulus spending? Public school teachers. Who, according to Vice President Joe Biden, accounted for 325,000 of the first 640,000 jobs "created or saved." While it's true that teachers are Americans (even my brother), in the vast majority of these cases, the jobs in question weren't "created," just maintained, since it is nearly impossible to fire public school teachers. while i doubt it is true in every case, it is certainly possible for every the citizens of every state to pay more federal tax than the state gets back. imagine each state pays $2 in taxes, sending a total of $100 to the feds. the feds then spend $50 on non state activity, be it military, foreign aid, debt service, whatever. each state gets back $1. the biggest issue here is that the feds pass unfunded mandates to the states, then they send money to pay for it, and over time, they take over the states. a federalist system dissolves as states become utterly beholden to DC and they lose more and more leverage. suddenly, we have federal educations standards, mileage standards, speed limits, drinking ages, etc and the states can no longer resist. this has the chilling effect of limiting the experimentation which is needed for best practices to emerge. Another response to "we send more money than we get back" is to tell them to start electing Senators and Representatives that will shrink the federal government instead of grow it. Yikes! That first figure sure looks familiar. Is there any set of data that WONT produce that shape? Considering how much of the federal budget is borrowed money, it's entirely possible that each and every every state in the union could get more "back" than it pays in taxes. It's not at all difficult for the government to manage things so that no one gets back as much value as they pay in.